Undoubtedly, DVD is gradually disappearing from home media. Increasing people prefer to watch movies, TV shows on streaming media. Furthermore, most PC manufactures are eliminating disc drives while developing the latest device. So what if you have a big collection of DVDs but couldn't find an available device to play them on? Let us discuss about a software, that I came to know recently. Buying a DVD player would cost huge amount of money, besides it doesn't allow you to play the DVD on digital device. Is there any perfect solution for this problem? WonderFox DVD Ripper Pro is a perfect DVD ripping software which allows you to play your DVD on any device you have. At the end of this post, I am going to share a Free License for all my readers, which I have received by partnering with them. DON'T FORGET to grab the 'Free License' of the 'WonderFox DVD Ripper Pro', shared at the end of the article, only for my blog readers. After launching the ripping software, you can see it's presented with a neat interface, which shows all the main features of it. There're three DVD source options: DVD Disc, ISO Image, and DVD Folder. It allows you to choose easily whatever DVD source you have. Let's take DVD Disc as an example. If you'd like to rip a DVD from DVD Disc, all you need to do is to click on the DVD Disc, you'll be asked which disc drive you want to read from and then the software will title the movie automatically. WonderFox enables you to choose the spoken and subtitle language by clicking on the Language and Subtitle bar if the DVD you have is multilingual. For example, if the DVD is equipped with two different language subtitles, you can remove the subtitle that you don't want. Also, you can add the subtitle to the video if the DVD doesn't have the appropriate subtitle for you. 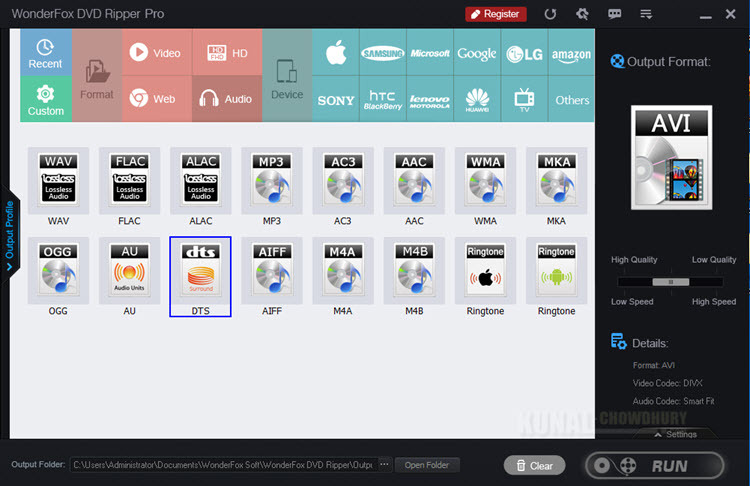 WonderFox DVD Ripper Pro is equipped with tons of video/audio formats and digital devices. Almost all the popular formats can be found here, you can rip DVD to AVI, and more formats such as: MP4, MKV, MPG, WMV, MOV, MTS, M4V, ASF, FLV, VOB, 3GP and etc. There're also lots of digital devices for you to choose if you're not sure which video format that your device supports. Click on the device options on the interface to find numerous digital devices. 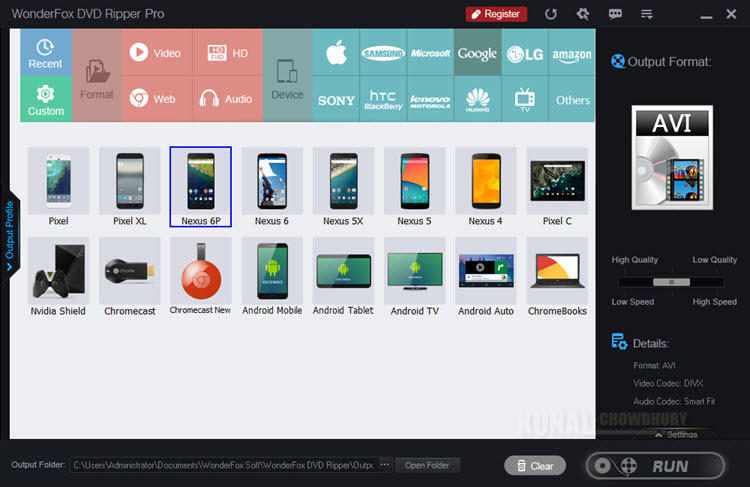 For example, it supports you to rip your DVD to tablet, which is used the most recently. Furthermore, what would you do if you're on a trip far away from home and want to enjoy your DVD collection during the traveling? The most common way is to store the video file into a server and stream it anytime, from anywhere. WonderFox DVD Ripper Pro can also allow you to rip DVD to OneDrive. WonderFox DVD Ripper Pro also allows you to extract audio from the DVD. After extracting the audio, there're lots of audio formats for you to choose. Not only lots of audio formats are supported here, it also allows you to create ringtone on your purpose with the extracted audio. You can feel free to create the ringtone no matter what smart phone you have. It works both for iPhone and Android phone. WonderFox DVD Ripper Pro is a solid piece of software, it looks simple and good on screen and does a great job in decoding. It performs perfectly with almost all the DVD loaded there. Besides, it also works with multiple regions, which is good if you have any foreign discs. The decoding process is completed fast. When I say fast, it doesn't mean it decodes every DVD in only few minutes, but it does offer a relatively faster encoding progress. And while taking a look at the high-quality ripped DVD it offers, I think it worth the time spent on it. Don't forget to download the product and activate the license before 30th October 2017. If you have come this far, it means that you liked what you are reading (WonderFox DVD Ripper Pro - Excellent DVD Ripping Software).